ISLAMABAD: The high treason case against former military dictator retired Gen Pervez Musharraf suffered a blow on Monday as head of the prosecution Mohammad Akram Sheikh tendered his resignation. In his resignation letter sent to the interior secretary, Advocate Sheikh expressed his inability to proceed with the case after the imminent change of government at the Centre. 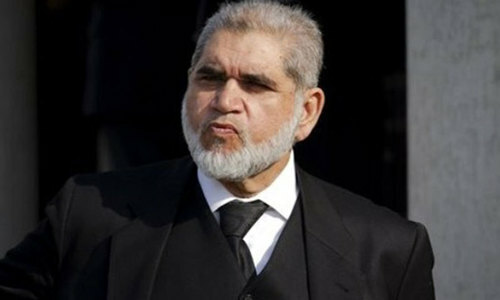 The Pakistan Muslim League-Nawaz government had appointed Akram Sheikh as head of the prosecution in the high treason case in November 2013. Initially, the legal team of Gen Musharraf challenged Advocate Sheikh’s appointment as chief prosecutor, but the special court seized with the high treason case as well as the Islamabad High Court (IHC) dismissed the challenge. The special court indicted Gen Musharraf for high treason in March 2014. The prosecution laid its evidence by September same year. However, thereafter, the special court could not proceed against the former dictator as the IHC issued a stay order and then Gen Musharraf left the country after the superior courts removed his name from the Exit Control List. The special court declared the accused a proclaimed offender and ordered confiscation of his properties which could not be attached due to the litigation in courts. The special court earlier this year resumed proceedings in the treason case and ordered that Gen Musharraf’s computerised national identity card (CNIC) and passport be blocked. The outgoing PML-N government in May executed the court order and blocked his CNIC and passport. However, Chief Justice of Pakistan Mian Saqib Nisar, during hearing of a case related to disqualification of Gen Musharraf, allowed him to return and restored his travel documents. Advocate Sheikh repeatedly requested the special court to conclude the trial and issue a verdict in the absence of Gen Musharraf, citing recent examples where the accountability court is conducting trial against former finance minister Ishaq Dar in absentia. However, after the general elections and possible change of government where it is obvious that Pakistan Tehreek-i-Insaf (PTI) is going to form the government, Advocate Sheikh mentioned in his resignation that the next government could engage a lawyer of its choice. Talking to Dawn, Advocate Sheikh confirmed that he had submitted the resignation to the interior ministry. If the PTI wanted to continue with the case, it could engage a lawyer to proceed with the case, he said. He, however, ruled out the possibility that any government may withdraw the treason case against Gen Musharraf. “It will be tantamount to aiding and abetting the accused person,” he said. The All Pakistan Muslim League (APML) of Gen Musharraf withdrew its candidate in support of Imran Khan from NA-53, Islamabad. APML head Dr Mohammad Amjad had filed his nomination papers, but later he withdrew in favour of the PTI chairman.